His poem goes on, with inimitable British solipsism, to determine that really whatever it was that Gaius Cestius had done in life to merit such a splendid tomb, in death his chief purpose was to “beckon pilgrim feet, with marble finger high” as they flock to the tombs of Keats and Shelley in the adjacent cemetery. Poor old Gaius Cestius becomes, for Hardy, little more than a signpost for dead Romantic poets. Which is to say, Gaius Cestius Epulo, son of Lucius, of the voting tribe Poblilia, praetor [chief magistrate], tribune of the plebs, one of seven state priests in charge of public banquets [the epulones] which celebrated various religious festivals. The choice of a pyramidical form suggests that Cestius may have served in the far reaching province of Nubia (southern Egypt/northern Sudan); the tall narrow pyramids of the region may have inspired his choice of tomb. This is a civil servant made good advertising his sophistication; the ultimate souvenir of a well-travelled man. That his tomb survives in such good condition can be attributed to its incorporation within the fortifications of the city in the late third century; those ancient buildings which survive tend to do so because they were turned into something else, usually churches or fortresses. In the 1660s, excavations found the bases of long since pillaged bronze statues. They bear inscriptions which name Cestius’ heirs (which include Augustus’ son-in-law Marcus Agrippa – leaving property to the Imperial family was not an uncommon way to curry favour). The inscriptions tell us that the statues were paid for by the ale of valuable tapestries from Pergamum (presumably picked up on another his travels) with which Cestius had intended to decorate the interior of the pyramid, but which contravened a law on luxury passed in 18 BC. 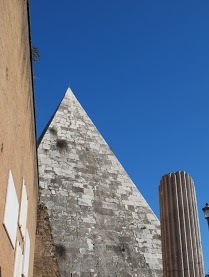 As Marcus Agrippa is known to have died in 12 BC the pyramid can be dated to between 18 and 12 BC. Instead of these attalici, the epitome of Eastern bling, the barrel-vaulted central chamber had to make do with simple but elegant fresco paintings. And last Saturday morning, thanks to the organization and enthusiasm of a fellow guide (thank you Guido! ), I was able to enter the pyramid. The interior of the pyramid is accessed by a low corridor carved out in the 17th century, originally it was entirely sealed. 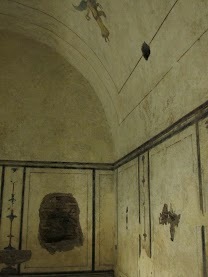 Despite damage caused by “tomb raiders”, including the theft of the sarcophagus and any other removable pieces, and the detachment of choice pieces of fresco (then sold as souvenirs to Grand Tourists), the chamber remains surprisingly well-preserved. 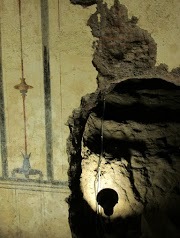 In the photograph above, alongside an elegantly painted candelabrum, the tunnel burrowed into the chamber by tomb raiders is visible. 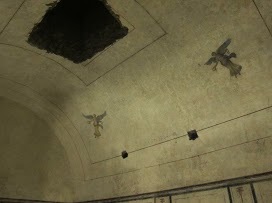 The barrel vault is decorated with four winged victories, while the damaged part in the centre indicates that the tomb raiders burrowed upwards into the pyramid in search of more loot. 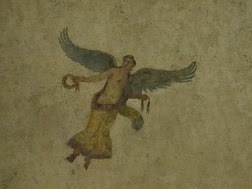 This mix of modern Roman painting within a monument inspired by far-flung tombs which predate Rome’s foundation is a wonderful analogy for the ancient city as a whole; elements were borrowed from the exotic and the ancient to create an eclectic architectural language which is spoken with a thoroughly Roman accent. Great post. 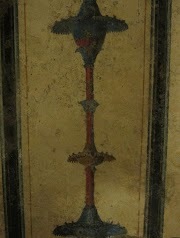 It’s too bad, but fairly predictable, that Cestius’ tomb was raided for its valuables.